Geoff and I attended the much anticipated Lonestar Showdown last night. The Ags played the Longhorns. It was a great game. Lots of excitement! Players ejected (from the horns) and mad coaches (Rick Barnes). I only use our tickets for a few games a year and this one was one of the ones I really wanted to see. I secured our babysitter and was looking forward to it. And to make it even better.... THE AGGIES WON!!! 80-63. We were ahead the whole time! Check out Rick Barnes....he didn't know what to think. And of course the scoreboard, although you really can't see the score! Well, today I ended my streak. I got a ticket taking Molly to school. 1st one in 3 years! I used to get at least 1 a year. I was doing so good. I was going 48 (supposedly) in a 35 construction zone. My insurance I had with me ran out in December I haven't put the new card in the car yet. So I got 2 violations, speeding and failure to show proof of insurance. He was nice enough not to check that it was in a construction zone so the fine won't be doubled....Defensive Driving Here I come. We have had a rough go these last few weeks. Molly was pretty sick right before her b-day and Geoff got a touch of it. Ally has had a very runny nose for 3 weeks...then I got a sinus infection. I think we are all on the upswing finally. I'm on antibiotics, and as of this morning so are both of the girls. We took advantage of the nice weather outside today to play outside. It's been too yucky to do that in a while. Oh, and this past weekend we were at my family's visiting. We got to see my nephew Nolan. Molly told us that he was her "Brover"...Well he was her cousin, but she calls him her "Brover." Oh Brover! Poor thing knows she'll probably never have one:) Here is a pic of Molly holding him. Sorry we passed our snot onto you Nolan, hope you are doing better! My firstborn turns 4 today. My how time flies. It truly has gone by so incredibly fast. I can't believe how grown up she is. It's amazing to look back at pictures from even 1 year ago and see how much she has changed. I remember 4 years ago being in labor anxious to meet this baby girl. When I first saw her, I was in love. My love for her has grown and grown over the years. I can't remember life before her. I can't remember not worrying about her every single day. Happy Birthday Molly Kate, I love you!!!! Busy weekend for us! Several things to tell you about. #1 --- Happy 30th Birthday to my good friend Julie. She was my very first friend at A&M and we are still very close! Love you Julie!!!!!! The girls at the Rehearsal dinner. 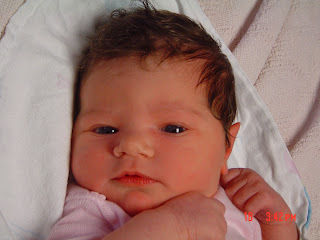 #3-- Last but definitely not least...My little girl turns 4 tomorrow!! Can't believe it. We had a great party for her yesterday. She had a blast! More on this subject to come! Yesterday was a crazy day for us Myers. It started with the "New Life..New Plan" motto and me and the girls hitting the gym for step class at 9 am. We left the gym and headed home only to have a blowout on the way home. Luckily we were in our neighborhood and not on a busy highway or something. So I pull over and Molly get's out to see what's going on. The tire was so flat, all the way to the rim. Molly starts yelling, " We have an emergency!!!" Luckily someone from Geoff's office came and rescued us and took us home. We took the car to the dealership and got a new tire. We thought it was a faulty tire (thus covered by warranty) because it exploded from the inside out...but apparently I drove over something...go figure. After the car saga, Molly was back to dance class after the Christmas break. At the end of each class the teachers choose the little girl who was good, listened well, and did an overall good job that day to take home the class bear for the week. This caused much drama in the beginning weeks of class. Molly would get so mad that she didn't get it. Well yesterday was her day!! She came out of class with her head held so high holding that bear. She was so proud and I was too. She did such a good job. She kept saying, "I am so happy!" I am proud of how she is maturing and starting to behave much better (most of the time). Moved 3 times in one year! I don't remembering making any. I had just had a baby and was too busy with the kids. Motivation to exercise. More free time. Surviving building a custom home and picking out every single detail!!! Besides the house, my Thork (haha Geoff) it's a cork board that's really thick for my kitchen. I LOVE it! My mom. She helped out with the girls and the house on so many ocassions. Dad helped too of course. Britney Spears! I mean, come on. Um, all of it went to the house. Beyonce.."To the left, to the left" Molly and I loved this song, we sang it all the way to Sea World and back! Fatter, and last year I had just had a baby!!!!! Weekend before Christmas and Christmas Eve with my family in Waxahachie, Christmas Day at our house in Bryan with Geoff's parents, and the weekend after Christmas in Houston with Geoff's family. No, that's kind of harsh. I am always reading so I can't even begin to think of the best one. Lots of things, furniture, etc. for the house. What's a film? Seriously, we don't watch many movies. I turned 30. I went out to dinner with family and then on a fabulous trip to Vegas with my cousin courtesy of my hubby. Usually comfortable mom-wear. Jeans are the norm. None, they are all kind of disappointing me lately. My family. Wish I lived closer. Is it sad that I can't think of anyone new that I met? Seriously, I am racking my brain...well I did meet lots of really cool new neighbors! Molly eating her PB and J sandwich at lunchtime. Ally eating--- not much--- for lunch. My girls being silly, as usual. That's our new family motto. We adopted the saying from a dear nameless friend. Molly even says it several times a day. Like most families we are on a new health plan for the new year. We joined a gym today!!! I am excited. Geoff and I haven't been gym members since we were first married. I always thought Molly was too little to stay in the childcare and then by the time she was big enough I was pregnant, and so on...the excuses go on and on. Any motivational advice out there??? Oh and speaking of "new", I bought a new camera! It's so great...here are a couple of pics from today! !